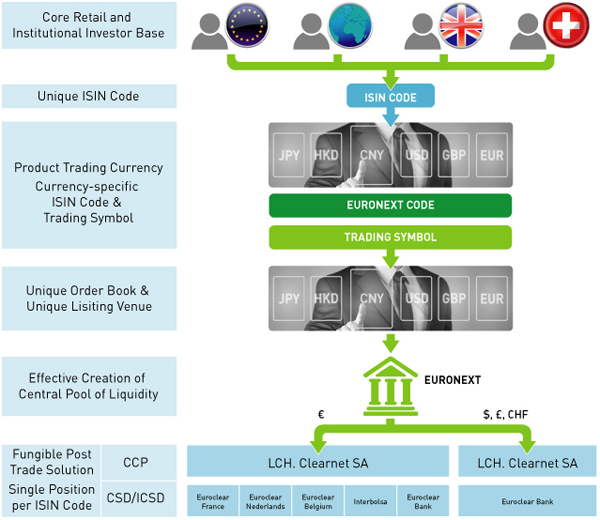 The multi-currency facility enables a single ISIN code to be listed and traded in 20 different global currencies, on separate Euronext venues. The multi-currency listing and trading service offers broader investment opportunities and facilitates investor access by removing currency barriers. Issuers can already enhance their product’s visibility through the Euronext multi-listing service, allowing a listing on several Euronext venues while centralizing liquidity in a single order book. Now, issuers can also list an ETF in a range of global currencies under one single ISIN code. The service helps issuers to improve the visibility of their listed products, and therefore broaden their possible target audience. This facility is applicable to all Euronext’s listed ETFs. Through our member community, investors on Euronext can trade the same ETF in different currencies, thus potentially enhancing the liquidity of the funds. The wide investor base accessible through our trading platform, combined with the multi-currency service and our new Liquidity Provider Program, make Euronext’s ETF market unique. The ETF market quality on Euronext is supervised on a daily basis by a dedicated team focused on monitoring all members’ activity with a single focus: to achieve superior market quality. The removal of currency barriers for investors is one of the key advantages of Euronext’s multi-currency offer: our service limits foreign exchange risk for worldwide and domestic investors looking to trade ETFs listed on Euronext. Having the option to trade the same product in several currencies is a significant advantage for overseas investors, expanding investment opportunities with more than 400 benchmarks available on Euronext’s ETFs market. Euronext’s multi-currency service is the broadest of its kind, with 20 different global currencies available for trading. This includes, for the first time either on a U.S. or European exchange, the Chinese Yuan Renminbi (CNY) and the Hong Kong Dollar (HKD).